Hinduism is a major religion of the world. The Hindus worship many Gods & Goddesses in the form of idols and pictures. Unfortunately, even though the Hindu deities are worshipped with much love and devotion, they are dishonoured at every moment somewhere or the other. This happens when (1) the pictures of Hindu Gods & Goddesses are discarded, (2) their idols are treated as playthings, (3) their idols & pictures are kept at unsuitable places, (4) their pictures & idols are left uncared and (5) the deities are represented in distorted manners in pictures & idols. As these incidences almost go unnoticed and unfelt, they continue to happen. 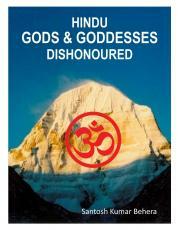 The book, The Hindu Gods & Goddesses Dishonoured, composed along with photographs, is a humble attempt to create awareness among the people, particularly the Hindus, about the injustice done to the Hindu deities and to bring changes in the prevailing situations. This book highlights different areas where the Hindu deities suffer the most and it proposes some suggestions to check the undesirable treatment done to the revered deities. As such, the wholehearted cooperation of dear readers is solicited in restoring the dignity and honour of Hindu Gods & Goddesses. This page was created in 0.2853 seconds.